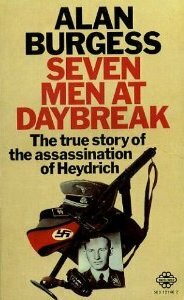 The attack on Heydrich and its aftermath is stylishly portrayed in "Operation Daybreak" (1975). The assassination of Heydrich in Prague in 1942 was not only one one of the most daring and audacious events within Nazi-occupied Europe during the war. Its horrific consequences as units of the German army and security carried out Hitler and Himmler's orders for revenge and retribution against the Czecho-Slovakian population was a war crime that provides one of the most horrific examples of the sadistic nature of Nazi rule. The assassination and the bitter fight between the assassination team and German military and security units that followed, involving betrayal and an amazing and heroic struggle to the death by outnumbered members of the that took place inside and underneath a Prague Cathedral, would seem to be an ideal subject for cinema. But only four feature films have been made. Perhaps the appalling aftermath of German atrocities against innocent Czechoslovakian civilians, including women and children, remains so bleakly horrific that film-makers are deterred from the subject. However, 2016 has provided a new take on the event. With the unfortunately sci-fi -sounding title Anthropoid (the code name of the plot to kill Heydrich), this British- Czech movie focuses in some detail on the scheming and planning involved in setting up the operation, and also on the climactic shoot-out between the resistance fighters and German soldiers in Prague's Karel Boromejsky Church. The three movies about the assassination are each interesting in their own way. The first two, Hangmen Also Die and Hitler's Madman, were made almost simultaneously in the USA in 1942. Hangmen was directed by the famed German Fritz Lang (in exile in Hollywood) and shows the influence of film noir. Another German exile was also involved in the movie. He was the famous German dramatist Bertolt Brecht, one of the twentieth century great literary figures, an avowed Communist and grumpily living in Hollywood, which he vociferously claimed to detest as unworthy of his cultural sensibilities. Hilter's Madman's director was also involved another artist who fled from Nazi Germany: Douglas Sirk. This was Sirk's first Hollywood film; he had been a well-known director for the famed UFA Studio in 1930s Berlin, his work praised by Goebels. 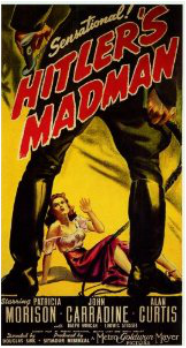 Madman was originally shot as a quickie B movie by one of Hollywood's poverty row studios but it MGM executives were so impressed that they bought it and screened it successfully as one of their premier releases. Operation Daybreak's director, however, was no emigre from Nazi Germany. This was a 1975 British movie directed by the veteran British director Lewis Gilbert in between a couple of his James Bond movies. Released as The Price of Freedom in the USA, this film is a surprisingly factual account, making good use of actual Prague locations. Gilbert was a very capable director of war and action movies, and the climax of the movie -even when the outcome is known - is engrossing. The epilogue explaining the terrible aftermath is succinct and moving. The film follows the true story of Czechoslovak paratroopers, trained by the RAF, who covertly drop back into the country during Nazi occupation and plot to assassinate Reinhard Heydrich, Reich-Protector of Bohemia and Moravia. Jamie Dornan (Fifty Shades of Grey) and Cillian Murphy (Batman Begins) star as paratroopers Jan Kubiš and Jozef Gabčík, who were tasked with the assassination. Kubis & Gabcik, leaders of the plot to kill Heydrich, as portrayed in 2016 movie 'Anthropoid'. Memorial to theCzech resistance fighters near the Cathedral crypt. 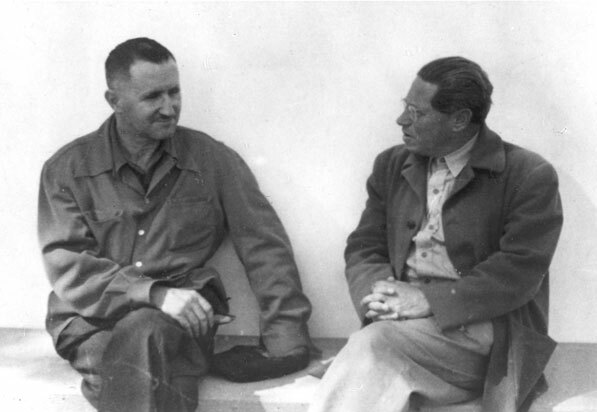 Brecht [left] with fellow emigre Lion Feuchtwanger. Still from Sirk's "Operation Madman". 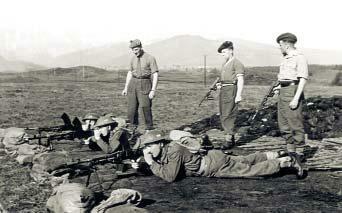 Members of the Czech team being trained in UK by Scots Guards. 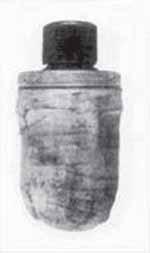 A special grenade of the type used by the assassination team. German poster offering reward for information about assassination. On 27 May, 1942, Reinhard Heydrich, Hitler's brutal Governor of Bohemia and Slovakia, head of the Reich Security Main Office, confidante of Himmler and Hitler, and one of the architects of the Third Reich's Final Solution, was severely wounded in an audacious ambush in Prague on Heydrich's unprotected vehicle. Although he appeared to be recovering from his injuries , he died a week later, presumably from an infection in one of his wounds resulting from grenade fragments, splinters from the car's seat-spring or even seat upholstery. The ambush was carried out by Josef Gabcik and Jan Kubis, two members of a small group run by the Czechoslovakian Government in exile, working in cooperation with Britain's Special Operations Executive, which parachuted in the members of the assassination team. The Nazi response was swift. 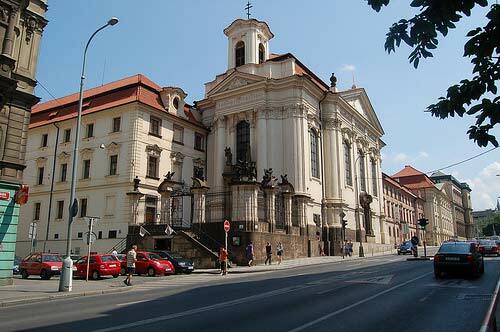 German troops and security tracked Gabcik and Kubis, and other members of their team, betrayed by one of their number, to their hiding place in Prague's St.Cyril and Methodius Cathedral. In the ensuing prolonged gunfight underneath the Cathedral at least fourteen Nazis were killed and Gabcik and the rest of the team committed suicide rather than be captured alive. The severely wounded Kubis died in hospital. The Nazi retaliation against the assassination was so brutal and sweeping that it remains one of the most cited examples of the numerous German atrocities carried out in Occupied Europe against civilian populations. Hitler ordered the Gestapo and the S.S. to "wade in blood" to track down Heydrich's attackers. The Nazis razed the small rural village of Lidice and the nearby hamlet of Lezaky, and murdered their male inhabitants. Lidice was chosen because it was suspected of sheltering some of the assassination team. Fifty-two local women were executed and the remainder sent to Ravensbruck concentration camp.These 184 women and 88 Lidice children were then, on orders of Adolf Eichmann, sent to Chelmno where they were gassed in special extermination gas vans. Six children died while they were being 'Germanized' in orphanages; seventeen survived this process. 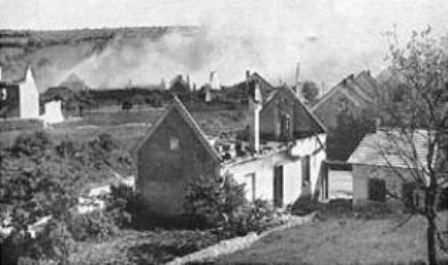 Lidice itself was burnt to the ground, all buildings destroyed and levelled by bulldozers and all its buildings destroyed. The village graveyard was desecrated: 400 graves were dug up. Even fruit-trees were uprooted and the local river diverted. Photo taken after the ambush, showing the sharp bend where the attack occurred and Heydrich's car, crippled by a grenade hurled by one of the attackers. Above left: village of Lidice on fire; top right, bodies of some of Lidice's male population following mass executions.